We are a K-12 school with approximately 200 students offering programming focused on meeting the needs of every learner and building community. Together we can; together we will! The number of instructional hours for every school is legislated by the Alberta Government in the School Act (Sections 56 & 97). School opening and closing days, general holidays and professional development days are laid out by the Board in the PHPS School Year Calendar. From there, schools have the ability to submit alternative calendars to the Board as per PHPS AP 60-05. Since families must often take an entire day to travel out of town to appointments, Swan Hills School has opted to lengthen the school day somewhat in order to schedule a number of no-school days for this purpose, with the goal of decreasing potential absenteeism. These days, on which no students or staff are expected to be at school, are known as ‘Alternate Days’. You can download a copy of the Swan Hills School 2018-2019 Calendar or view the online calendar, which also includes school events. Swan Hills is a young community, developed during the resource exploration years since 1959. The first school consisted of two portables placed on site in 1960. 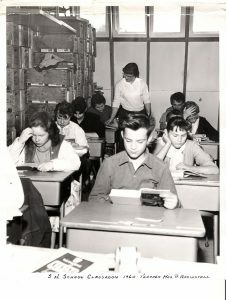 Two classrooms were added in 1962 and by 1964 the community had grown to the point where some permanent facilities were needed. An addition consisting of six classrooms, a science room, an ancillary room (large classroom), a library and the present large gym were added. This complex served the community until 1972 when two more portable classrooms were added. These were removed in 1985. In 1984 the school board, with its own funds, added space for gym storage and a mechanical room. In 1975, six classrooms were added to the building. At the same time, the Town of Swan Hills funded an indoor heated swimming pool. In 1979, two classrooms, two ancillary rooms (present stage), a primary gym and a new library were added. Aside from regular upgrading, the facility remained the same until 1995, when a new administrative suite, staff workroom, no barrier washroom, wheelchair access, counselor’s office, staff washrooms, computer lab, conference room and a renovated staff room were added. In terms of numbers and grade configurations, Swan Hills School has seen many changes. Up until the late 60s, SHS was a K-12 school. The numbers were quite small in the high school, so it became unfeasible to continue operations, and students in high school were bussed an hour away to Barrhead. Throughout the 1970s and 80s, SHS was a thriving K-9 school with an average of around 550 students. 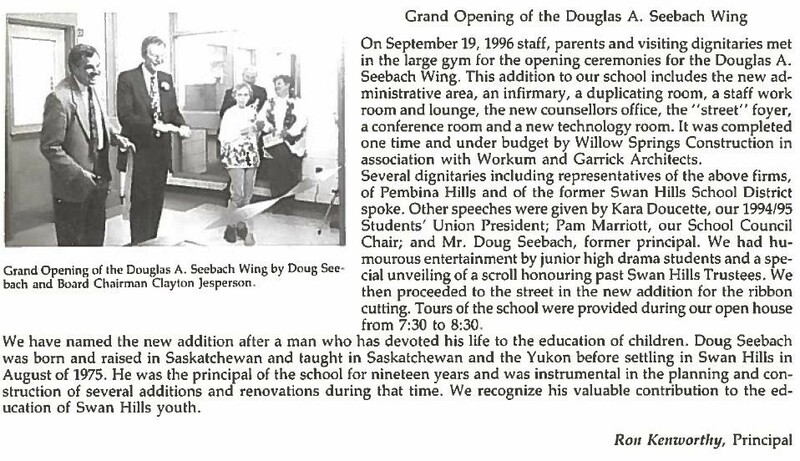 We had one principal, who served the school during this time for twenty-four years: Doug Seebach. SHS had a well-established band program that had roughly sixty participants and a strong drama program that did yearly dinner theatre performances of a variety of musicals. We also had a very strong inter-scholastic sports program with high student participation during this time. The mid-1990s saw a great deal of change for SHS. A number of events took place in a very short period of time that had a tremendous effect on the school. During the 1990s, SH School District amalgamated with the Barrhead and Westlock School Divisions to form the Pembina Hills School Division that we know and love today. This is also the time that our long-standing principal retired and the division reinstated our high school program. In addition, the oil boom of the ninties was over and our population saw a tremendous decline form nearly 3000 people to a bit less than 2000. This had a huge impact on our enrolments to what we see today, which is on average 200 students K-12. This impacted a lot of our fine arts programming and extra-curricular programming as the numbers continued to plummet. From the mid-ninties to present day, there was also a great deal of turnover in staff including administration. The staff has worked very hard to maintain and build a safe, consistent and successful environment for children. We are seeing good stability in staff and attitudes in the community are positive. We have a very strong School Council and fundraising arm, Grizzly Cubs, who are also working very hard to make some incredible strides. As with all schools, we have room to grow, but programs are expanding, the staff is motivated and children are seeing great success!